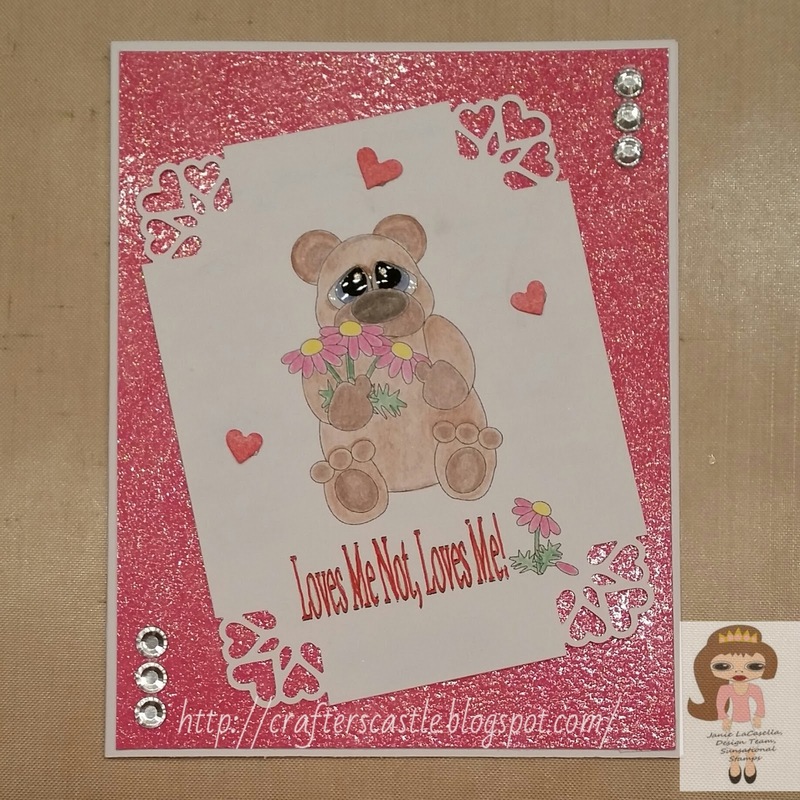 Here is another Valentine for one of my grandbabies. This is the first of the Valentine's I'm making for my grandkids. Besides the fact that it is adorble, it is also easy to color. If you are wondering about those glassy eyes....that was done with Liquid Glass from CTMH ...I thought it helped the eyes look more realistic. 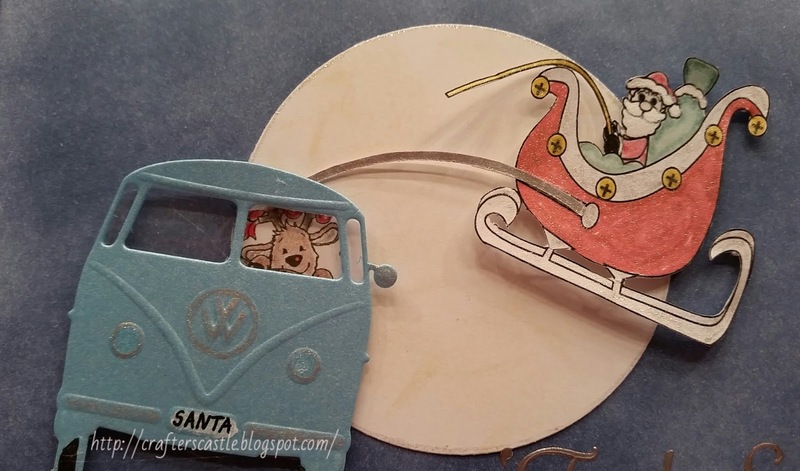 colored with Tim Holtz Distress Markers. This just might be my favorite!!! The paper/cardstock is from the Damsel In Distress Digital Paper set, and the flowers and sentiment are from the Blossoming Digital Stamp Set and colored with Tim Holtz Distress Markers. I made the step on the left side of this card instead of the right side like I show in my tutorial. 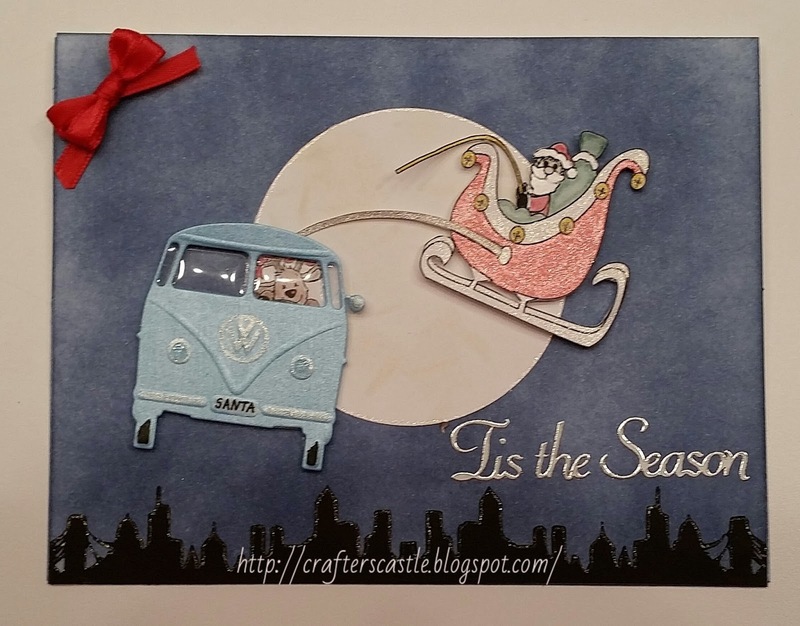 Here is another one of the Side Step Rocker cards I made. This one has TWO steps on the side. I decided to make a birthday card for one of my precious granddaughters, and what could more perfect than a Bestie! I had to tip it up a little to get better lighting on it...was hoping you could see the sparkle on the cupcake, balloon, and Happy Birthday.....I just couldn't get a good angle. I used the Print & Cut feature of my Cricut Explore to make the 3D Bestie. I hope you saw my previous post with another Side Step Rocker card and also the link to the tutorial on how to make these cards. I saw a card that I'm calling a Side Step Rocker Card. The directions were in metric which I don't have the patience to convert, so I just figured it out for myself. Then I decided I wanted one with TWO steps on the side, so with a little trial and error I came up with a way to make that too. Here is a card I made using just the basic one step. The Eifel Tower is an image from Cricut cartridge Summer In Paris. The flower were made with Tim Holtz Alterations die Tattered Florals. 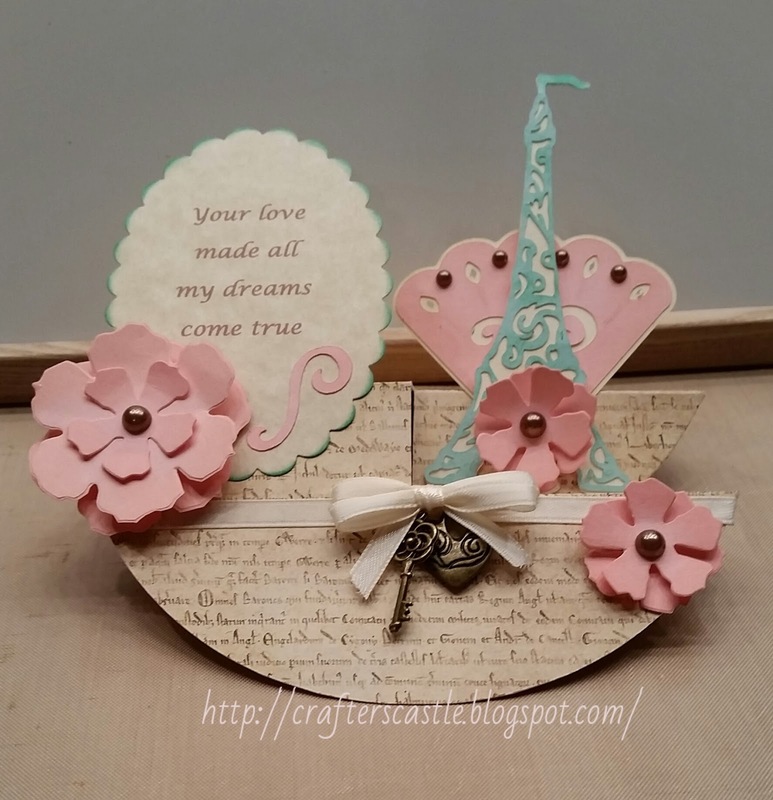 The oval for the sentiment was made using Sizzix Scalloped Oval die set. Distress Inks were used to accent the flowers, the oval, and Eifel Tower. I will be posting more of these cards over the next few days. I know it's a little late, but it was a late Christmas card for my daughter and I had to wait til she got it before posting it. My daughter owns a blue VW bus and I saw this die in one of my craft magazines and had to have it. It is by Marianne Design and I got it at 123Stitch and I used my Cuttlebug to cut and emboss it. The border at bottom I made using my Cricut Explore and the Plantin School Book cartridge. that cute little reindeer driving the VW is Peeking Reindeer from Great Impressions Stamps ....he is just the cutest little thing!!! My daughter LOVES this card and I know she will treasure it. It was so fun to make. I hope I made it easy to follow. If you have any questions or comments you can leave them here or on YouTube and I will reply promptly. and don't miss out on their monthly challenges!!! Here is the final video in my 4 part series on Distress Ink. I'm sure you can come up with many more uses and techniqes and I would love to see them. If you make a video or just want to share your ideas I would love it if you would leave me a comment.